Nikita Burmakin: “On the court we play a sports game. Behind the court - strategic”. In the updated ITF ranking, the Russian Nikita Burmakin became №1 in the world in men’s ranking. 2 weeks ago we managed to do an interview right at the airport after returning from a tournament in Aruba, where Nikita had a sensational victory. When did you first feel that you could be the №1 in the world? I had this dream on the very first day when I saw beach tennis and found out that there are World and European Championships, as well as a real world’s tour. Than beach tennis was already officially recognized by the Ministry of Sport of the Russian Federation, and was being developed by ITF. In theory, tennis on the beach was for me an ideal combination, since from early childhood I was seriously engaged in classic tennis and already in my student years I managed to “play out” classic volleyball. After some time I really became interested in beach tennis, I was selected to the Russian national team and began to travel for tournaments. But the real feeling that I could be the NUMBER 1 in the world came, when we won the World Team Championship in Moscow in the final against the Italian National Team in 2016. It was a miracle for the Russian national team, winning the best players in the world in doubles and the mixed in the most dramatic fights. But in those days I did not have enough class to win several games in a row at a high level. But over the years this also has come. To qualify for first place in the world rankings, it was necessary to reach the finals of the three largest tournaments and win 10 more during the year. 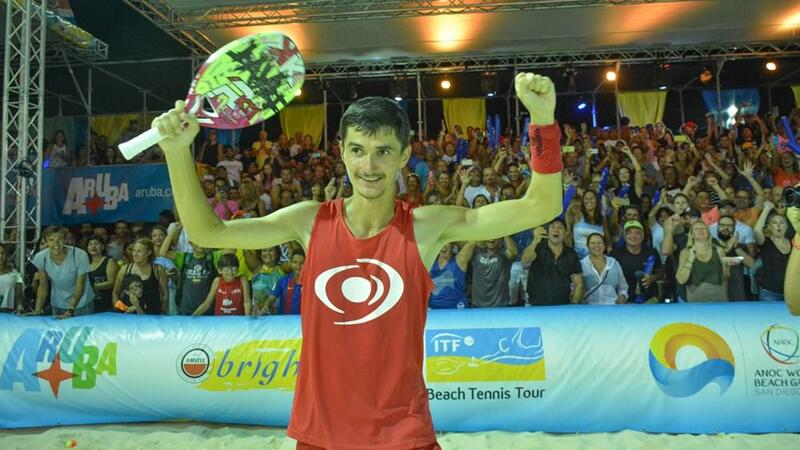 The fate of the first place was decided at the final of the largest tournament in the world - Aruba Beach Tennis Open, where I needed to win to fulfill my dream. In the semifinals, we set a record for the length of the match - 3 hours and 17 minutes and won with a score of 3/6 7/6 7/6 (13-11). Our opponents had 4 match points! The final took place in 2 hours and again a strong-willed victory! Honestly, I still can not finally believe that everything turned out! What did you learn to be able to win several matches in a row? Great training work and, of course, the bitter experience of losses. How does Nikita Burmakin train and prepare for tournaments? The nuances of the training process, I still will leave as a secret. I can only say that my coach is my father. I would like to spend more time on physical training. Unfortunately, due to the fact that I also work as a coach, there is almost no strength left for more practices. Who are you: a coach or a professional player? In recent years - of course, the player. In another way victories can not be achieved. All priorities are placed on this. At the same time, unfortunately, the life of beach tennis players is financially difficult, even for the №1 in the world. We can only dream of professionalism, while we hold on to great enthusiasm and love for sport. The №1 in the world has no sponsors, advertising contracts? This is my 2nd day as №1 in the world, there are no serious sponsors yet. I am open to cooperation, beach tennis is actively developing. At the final of the World Championship in Italy was attended by about 4 thousand spectators, and the video broadcast gained about 50 thousand views. The geography of tournaments is very extensive and diverse - the whole of Europe, Russia, America, the Caribbean, Brazil, Ecuador, South Africa, Thailand, Japan and many other countries. ITF is actively working on the adaptation of the image and format of the game for TV broadcasts. By the way, the World Beach Games 2019 in San Diego will be broadcast on the NBC and NBC Olympics! The Italian company Rakkettone produces for me a personal racket called “Davai”. Together we carefully develop and improve it to make it as good as possible in the game. I am very pleased with this, I think that I have one of the most thoughtful and high-quality rackets in the tour. How did your attitude to beach tennis change as your rating was increasing? I immediately liked this sport. Of course, along with the development of beach tennis, along with the growth of tournaments, the growth of prize money, the increase of the number of trips, it became more and more interesting. If there were no such development, then at some point I would have to finish. We hope that beach tennis will be a test sport of the Olympics in 2024, and in 2028 will enter the program of the Olympics! And in 2019, the focus is on the first World Beach Games in San Diego, which are held by the Association of National Olympic Committees (ANOC). This is the most important event in our sports life and we will seriously prepare for the fight for medals! Who helped with your development as a beach tennis player? First of all, my father, Gennady Burmakin. He coached me from my first sports day, taught me to be an athlete, to grow and not to give up. By the way, on the day of my departure for the tournament in Aruba, we had an excellent training session. I thank the Tennis Federation of Russia, especially Shamil Tarpishchev and Dmitry Viharev. They believed in a new sport, gave it the green light and are actively involved in the development of beach tennis, not only in our country, but throughout the world! Today we have the most important tournaments: World Team Championship and one of the biggest tournaments in Kazan. The most important role was played by Makarov Kirill, who opened in St. Petersburg the first and for several years the only indoor beach center in our country, “Dynamit”, where many members of the Russian beach tennis, football and volleyball teams train and play. We are very lucky to have this center. If he had not done that, I would simply not started to play. Now the St. Petersburg Tennis Federation supports beach tennis and provides the foundation for the Russian team. Doctor Rinat Akbarov, who I met 4 days before my first and one of the main victories at the World Team Championship in Moscow, did wonders with me. He then restored me from an incredibly poor psycho-physical condition, after a terrible loss in Kazan, helped me get together correctly and win almost impossible matches against the legends of beach tennis. Since then, we are constantly working with him, carry out rehabilitation and preparation for new starts. Of course, many more people contributed to my victories, I remember everyone and I really appreciate it! Tell me about your partner? My partner in most tournaments is Italian Tommaso Giovannini. He is very young, but he turned out to be the best combination of style for me. It is interesting to note, I have never played in major tournaments with top players. They are all Italians, and mostly play with each other, trying not to let others win. I started to play with Giovannini when he was 120th in the world. And we have grown to the point of becoming the №1 and №2 in the world with a large margin from the rest. This is a particularly phenomenal result. What did you feel during the semi-finals when your opponents (Benussi / Beccaccioli) had match points? That we still can win, it happened. Your first thought after the end of the final? I wanted to thank everyone who supported. In the semifinals, we spent a lot of strength. The final was played almost immediately - after 2 hours. There was no time to recover: there was almost no energy left, neither moral nor physical. At the final, Russian fans and players helped us a lot. They sometimes shouted over a 3,000-strong stadium! Everyone was madly tired, but shouted to the last, tearing voices. And it helped me a lot, filled the lack of energy, so I immediately went to thank everyone. All in all, it was fantastic! At this tournament in Aruba, your primary goal was to be the №1 in the world or to win this tournament? One thing did not exclude the other, but, of course, it was more important for me to be the №1 in the world. I must say, I became the №1 without going to court. Because it was enough for me that Ramos and Cramarossa would lose before the final. They did it in the second round. So the question of would I be №1 or not, simply left. And then I focused entirely on winning the tournament. What are your future goals? You have already won the World Team Championship and Individual World Championship, the European Championships, Kazan, Aruba, became the №1 in the world, what next? World Beach Games in San Diego! As for the ranking, then, as all former first rackets of the world say - is easier to become the №1 than to hold on. So there is a new challenge - to stay on top. On the court we are playing a sports game, behind the court - a strategic one. Therefore, I always have to keep my finger on the pulse. Do you really feel as the №1 / best one in this sport at the moment? It is difficult yet to realize. And in general, to judge yourself correctly. But when I play on the court, I have to feel myself as the strongest. Otherwise, I can not win. And the rest you need to watch the rating, statistics. The result of a single tournament (edt. : Nikita - the winner of a single tournament in Aruba, where all the strongest players took part) - everything speaks for me, so I hope that it is. And I will work on!